The Distrito Federal Box Y Lucha Commission is the leading regulating group of lucha libre in the country. Each state has it's own commission, and each is able to run it's area as it wants under the national rules, but the Mexico City commission covers the most amount of shows, largest populace, and all of the national championships. The commissions are technically responsible to make sure all luchadors and referees are qualified and licensed to be ring, that the promoters are operating properly and that championships matches are within the rules set down (including participants making weight.) In recent years, they've been reduced to collecting a fee from promoters from running the show, collecting a fee for licensing, and being a prop for storylines. The championships had scarcely been seen in recent decades, and only then in barely explained small level title tournaments or obscure cameo appearances. The five weight division championships were declared vacant in 2012 and held up in separate title tournaments in April 2012 at Mexico City Fair, over three weekends. The full list of participants in the tournaments, or the brackets, or anything besides the dates the tournament would be held and the eventually finalists, were never released. It's believed actual tournaments probably took place, including CMLL and independent luchadors, but it's not a certainty. 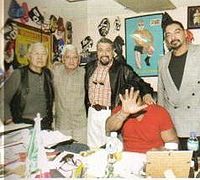 The shows themselves were promoted by El Signo and the title tournaments were sanctioned personally by El Fantasma. Their sons, Hijo del Signo and Hijo del Fantasma won their tournaments, allowing both to carry championships belts they were unlikely to win in CMLL proper at any time. CMLL has acknowledged the championships, but they have not been defended in CMLL rings. The DF commission has also controlled and sanctioned championships for Mexico State and other neighboring areas when there is no active local commission. This page was last edited on 2 October 2015, at 15:56.